The incumbent MLA from Kodad, who is also married to the TPCC chief Uttam Kumar Reddy, says she believes her husband deserves the CM’s chair. On a hot and dusty day in November, the sleepy town of Kodad is stirring awake, only to be rankled by loud, colourful campaign vehicles that extol the virtues of political leaders, past and present. 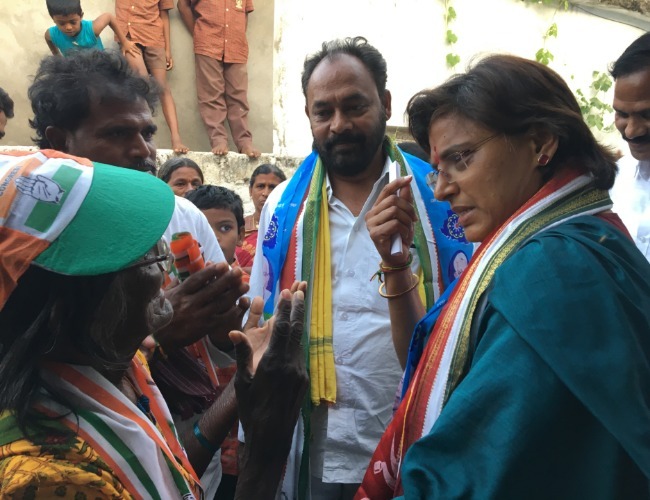 Even as India’s youngest state, Telangana, is gearing up for elections on December 7, incumbent Congress MLA Padmavathi Reddy is campaign-hopping from the urban to the rural parts of her constituency in Suryapet district. Seeking out people from different walks of life-- from sugar mill owners to cattle farmers-- Padmavathi has a gruelling schedule ahead of her. Even as she enters the home of a local leader in Thogarrai village, chants of ‘Jai Congress’ rent the air. With three colourful party flags draped around her neck, Padmavathi Reddy carries one message: the Prajakutami or People’s Front, the umbrella alliance of the Indian National Congress, the Telugu Desam Party and the Telangana Jana Samithi (TJS), along with the CPI, must win. “Fours years of being an MLA under this particular government was a big disappointment. It was also very dissatisfying,” she tells TNM, surrounded by party men eager to record her speech. “I had faith in the Indian system and that even as an opposition MLA, we could get certain things done if we put enough interest in it. But under this government, I was quite disappointed with the results,” she says. As a first-time candidate, Padmavathi Reddy was one of just 21 Congress MLAs who won the Assembly Elections in 2014. Kodad has long been a Congress strong-hold with Padmavathi’s husband and Telangana Congress President Uttam Kumar Reddy having been elected from here twice in the past. So what has she changed in the constituency over the last four years and what is the road ahead? “Kodad is quite an affluent constituency. Earlier, Uttam Kumar Reddy was the MLA. During that time itself, basic infrastructure like lift canals, roads, electricity, drinking water facilities and all was put into place. Now the problems were about repairing a lot of those lift canals since the city has grown. More new roads need to be laid. There is a major drinking water problem because the town has grown.” she explains, adding that the need for irrigation and drinking water systems at Mothey mandal in the district is also a challenge. Padmavathi laments that the state, wealthy during the time of bifurcation, has been “bungled up into a financial mess” by the ruling Telangana Rashtra Samithi (TRS). “We are hoping to change (things) because we are hoping our government will come to power soon now in these coming elections. Congress party knows how to administer and give good governance,” she claims. On the political front, Padmavathi finds herself between old timers in the party who have been increasingly vocal against nepotism in the ranks and her husband, the party chief in the state. In fact, her ticket was among the last to be announced by the party. Defending this, she says that the ‘one ticket per family’ rule did not apply to incumbent MLAs to begin with. The delayed announcement, she says, was to calm things down. Dispelling rumours of dissent within the party, Padmavathi says that she is a woman in her own right and has been recognised by the Congress as such. The MLA acknowledges women voters in the constituency, who outnumber the men, give her a much-needed shot in the arm. Husband as Chief Minister? Why not? One of the most-watched aspects of this election has also been the race for the top job within the People’s Front alliance, in the event that they prove to be successful on December 7. With several strong Congress veterans in the state like DK Aruna, Shashidhar Reddy, Ponnala Lakshmaiah and Revanth Reddy, Uttam Kumar too is in the race. “Why not?” she shoots back in response to her husband’s Chief Ministerial ambitions.